A block of rooms has been reserved at Clinton Inn, Tenafly at a discounted rate. 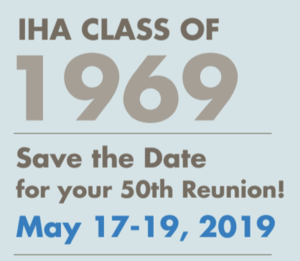 Continuing the IHA tradition of establishing a scholarship for a deserving student, the Class of 1969 is setting up a fund for this worthwhile cause. Your donation will be gratefully accepted. Email Kathy Dennen Morris’69 at kathymorris513@gmail.com or ihaclassof69reunion@ihanj.com with your mailing address and phone number to receive updates. More details to come!